It was in 1934 that Federal Housing Administration came into existence. This was the time when the United States was under “The Great Depression”. The main objective behind launching of FHA Mortgage was to help more and more people own homes. A Federal Housing Administration or an FHA mortgage refers to a government-aided home loan that comes with some of the best terms. More than 70% of the population in USA opts for the FHA loan because of the easy qualification process. This loan does not usually consider the borrower’s age as long as the co-borrower is legally able to sign. Many companies as well as FHA-approved lenders offer FHA mortgages. Despite the demand for FHA loans, there are quite a lot of lenders who are on the lookout for borrowers. They buy the details of such prospective borrowers in the form of FHA leads and start contacting them. The eligibility criteria, interest rates and the various costs vary from one lender to the other. You will have to understand all this before deciding on a particular lender. You will also have to check out their authenticity and make sure they are approved by the HUD and the FHA. You can also check out a few reviews or talk to a few people who have borrowed loans from them. The Federal Housing Administration is actually a government agency owned byHUD or the U.S Housing and Urban Development. This agencyis not into offering or refinancing mortgages. It onlyprovides mortgage insurance to credit unions, banks and other lenders who meet the FHA insurance standards. It reimbursesthe losses of the lender in case of a short sale or foreclosure, when the borrower defaults. The low-down payment requirements of FHA loans may seem as though this type of mortgages are only for first-time home buyers; but it is not so in reality. Anyone can go for this kind of mortgage. In fact as a repeated buyer, you can use a portion of the amount you obtained by selling your previous house, as the down payment for your new house. FHA does not require 20% down payment unlike other mortgage types. The required down payment is only 3.5% with minimal qualification and conditions. Hence these mortgages are known as lenient mortgages across USA. In areas where the property prices are high, you can get an FHA loan up to $636,150. A FICO score of 580 is what you may need in order to get an FHA loan. However, not having this minimal score does not restrict you from applying for one. You can still get a loan if you are prepared to make a 10% down payment instead of the standard 3.5%. The long term cost of your FHA loan will be decided only after considering your loan amount, your down payment amount and the location of your property. Therefore it is always better to compare this option with the other loan types to decide which one is more cost-effective. Unlike other types of mortgages, the mortgage rate is not the biggest cost here. It is the FHA mortgage insurance that costs you the maximum. How is eligible for FHA mortgages? The house that you are going to buy should meet certain criteria and must be rectified and approved by FHA-approved appraisers. The house that you are going to buy should be your primary residence. You should have enough funds to make the 3.5% down payment. There is a maximum mortgage limit that depends on the state that you live in. A 3.5% down payment is what you need to make in an FHA mortgage as compared to the 20% that is required in the case of conventional mortgage. The margin is huge. You may probably wonder, like: “Can I get an FHA Mortgage with a low score?” The answer is – “Yes!” A FICO score of 580 (which is really low) is usually required to qualify for FHA mortgages. However, you can definitely get an FHA loan, even if your score is much lower than this. You may have to pay 10% down payment instead of the 3.5%. If you have borrowed a conventional mortgage with an ARM option, you can easily convert it into a fixed rate mortgage by refinancing it through an FHA loan. This is what many people do across USA. What to consider before applying for an FHA Mortgage? Come up with a home buying budget and stick to it. You may have to consider your monthly income and expenses in order to estimate this. 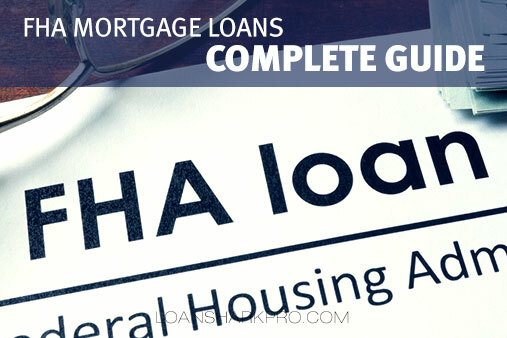 However, it is better to do this exercise before you start talking to any of the FHA mortgage lenders, who contact you by purchasing FHA leads. Always make use of HUD websites to find FHA mortgage lenders in your city. Private lenders may have their own websites which you may like to check out. Verify the authenticity of the lenders through BBB or better business bureau websites. Look for complaints if any against the lender you are considering for FHA loan. You should find them on Google. Make sure you understand all the terms and conditions before you sign your loan application. Whether you have a low credit score or no credit score, you can definitely go for an FHA mortgage. Compare your options, make sure you decide on the right lender and apply for your mortgage today!